Happy Wednesday! 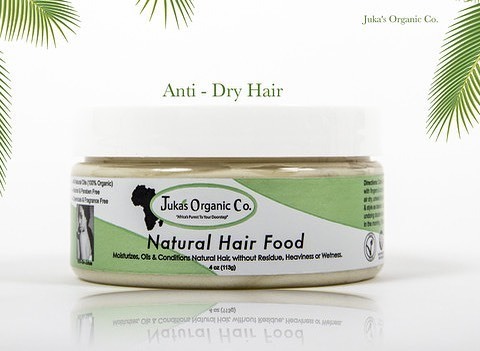 We are skipping food today for beauty talk ... – Juka's Organic Co.
Just like leaves , likewise skin and hair can wrinkled or damage rather quickly if it doesn’t retain enough moisture. As african descendants, we are extremely lucky to have enough natural oil and moisture that our skin produces to keep our skin youthful but our hair is not so lucky in keeping itself moisturize. But no worries, this is where we come in with our Natural Hair Food. This is a new generation of taking care of natural hair, with all organic natural food oils. Instantly helps soften & tame rough textures leaving hair very soft, manageable, hydrated, moisturized, polished & smooth. The perfect combination of all the necessary food for the body is carefully selected, extracted into the purest natural oils, put together to soak deep into dry hair to smooth each strand of hair in to perfection. Give your hair the food it needs to stop breakage, split ends, dryness and give it maximum strength to promote growth. Here at Juka’s, we love and admire girls that rock natural hair styles. And if you are too busy to rock the natural look and you wear hair extention, remember you can still keep your own hair manageable, long and healthy. Click on link to order a jar and try it out.